A collection of fall math activities for kids using leaves. Obviously, we love math at our house, considering my son has hypernumeracy. He practically lives and breathes math. As a result, we are always looking for more fun ideas that encourage him to play and explore math further. And since it's officially fall, I thought it would be fun to find a bunch of fall leaves themed math activities for him. 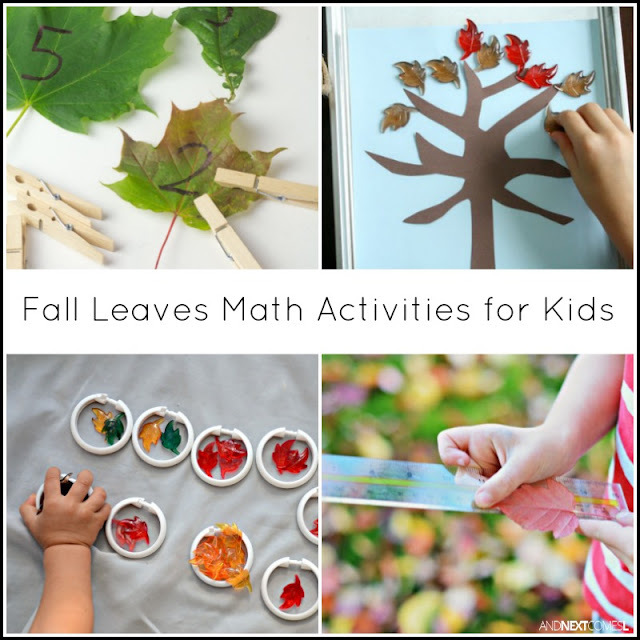 So here are some awesome fall math activities for kids using leaves. 1. Measuring Fall Leaves - Enjoy the fall weather with this simple outdoor math exploration. 2. Fall Leaves Math Tray - Set up this simple math tray for the kids and let them explore grouping. 3. Fine Motor Counting Activity from Kids Craft Room - Grab some colorful leaves and try this fine motor math activity! 4. Falling Leaves Math Activity from Fantastic Fun and Learning - Throw the leaves up, let them fall, and add them up! Seriously, how fun would this be for active kids?! 5. Free Printable Fall Leaves I Spy Game - Use this free printable I spy game to work on counting. 6. 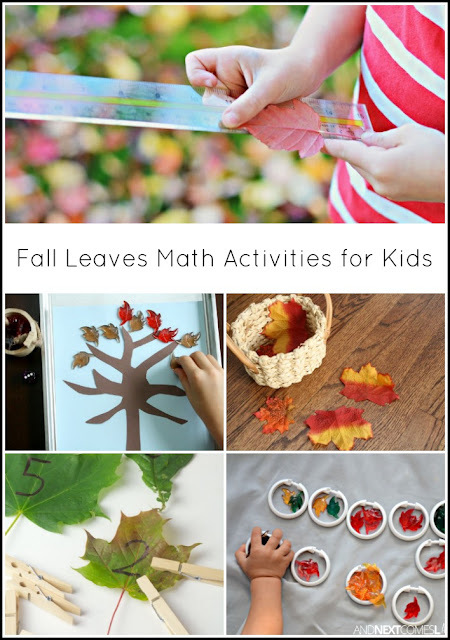 Fall Leaf Hunt Math Activities with Free Printable from Edventures with Kids - I love all of the different math ideas to go along with this free printable fall leaf hunt activity. 7. Fun Ways to Measure Nature from Mother Natured - I love all the fun ways that the kids can head outdoors to weigh and measure the beautifully colored fall leaves and the trees they fell from. 8. Free Printable Fall Harvest I Spy Game - Count leaves, pumpkins, and other harvest imagery with this free printable. 9. Roll & Count Fall Leaves Math Activity from Fantastic Fun and Learning - Dice, leaves, counting...pretty sure my kids would enjoy this activity! 10. Fall Leaves Grid Game with Printable from Simple Fun for Kids - This activity is great for working on counting and one-to-one correspondence. 11. Contact Paper Fall Tree Counting Game from Simple Fun for Kids - We've done an activity similar to this one, only we did it on the light table and without the math component. However, I love the addition of the die to encourage counting and math exploration. 12. Fall Counting Game from Little Bins for Little Hands - I love that this game combines fine motor practice, sensory play, and math all in one!